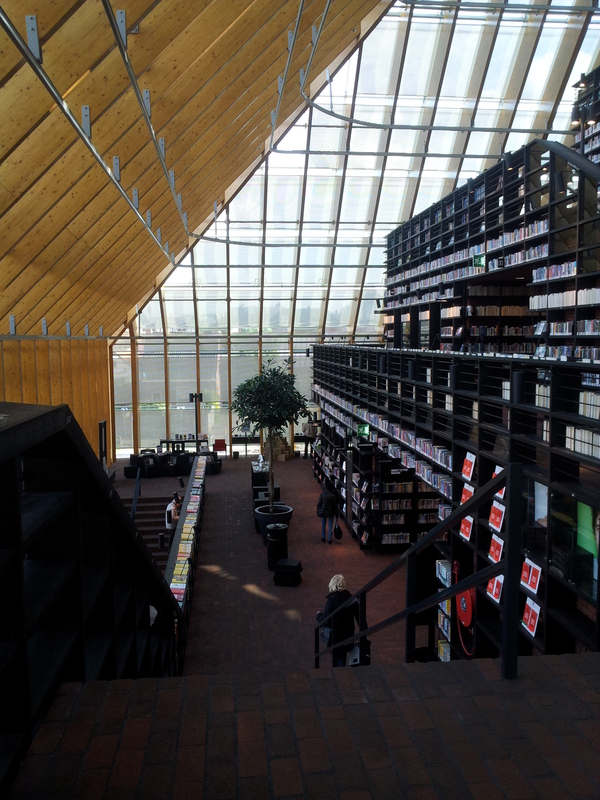 On Tuesday I visited the second best library in Holland. It was conveniently placed in the town where I was born and spent most of my life, but then gladly moved away from four years ago. 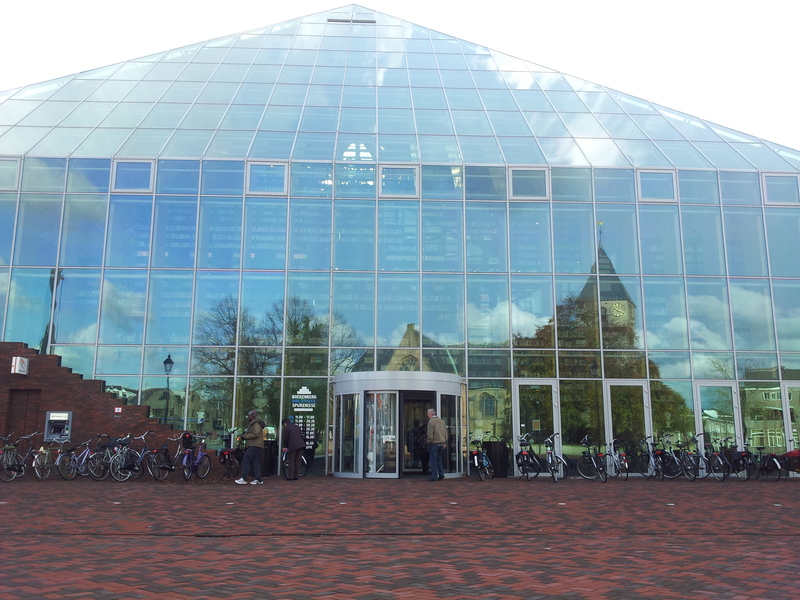 However, for a library that was recently crowned as the second best in the country (only being succeeded by Amsterdam) I had no qualms about returning. 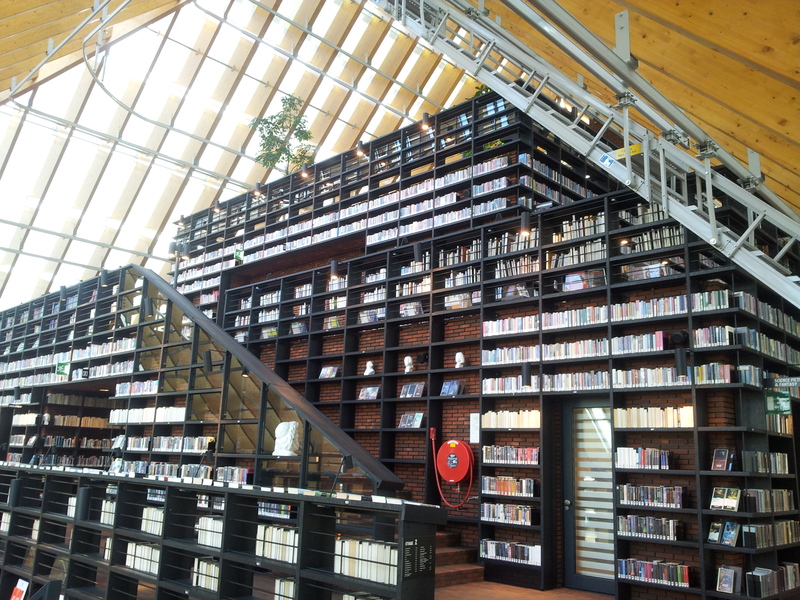 The Boekenberg, which translates to ‘the Mountain of Books’, is a glass pyramid from the outside and a whole lot of books on the inside. The building is a small ecological wonder, using solar power and it has high hopes of becoming completely self-sufficient in a couple of years. While I cannot imagine that anyone is against creating a better environment, this is not the thing you want to read about as book lover and library goer. Let’s show those books! Is it a mountain or a pyramid? While I had already seen quite a lot of images around the web of the outside and also the general mountainous structure of the library, it was more amazing than I had thought. 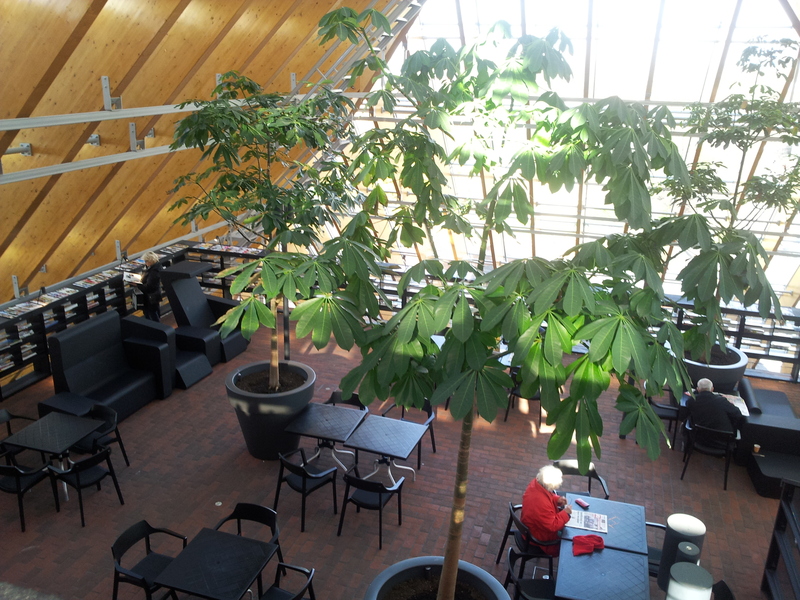 Large potted plants were placed all over the library and when I say large I mean twice my own size. The entrance was filled with books and magazines and strange white busts of famous people. I found this a tiny bit disturbing, as completely white eyes without pupils often are, but the amount of books and book-like objects were a great distraction. 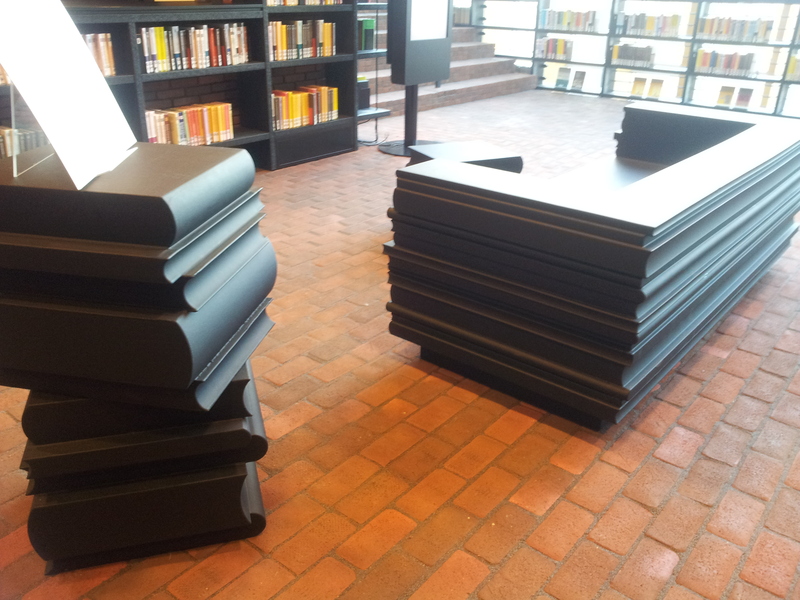 Book-shaped furniture! It’s surprisingly soft and comfy. The first thing that I noticed was the amount of technology and self-service in the library. 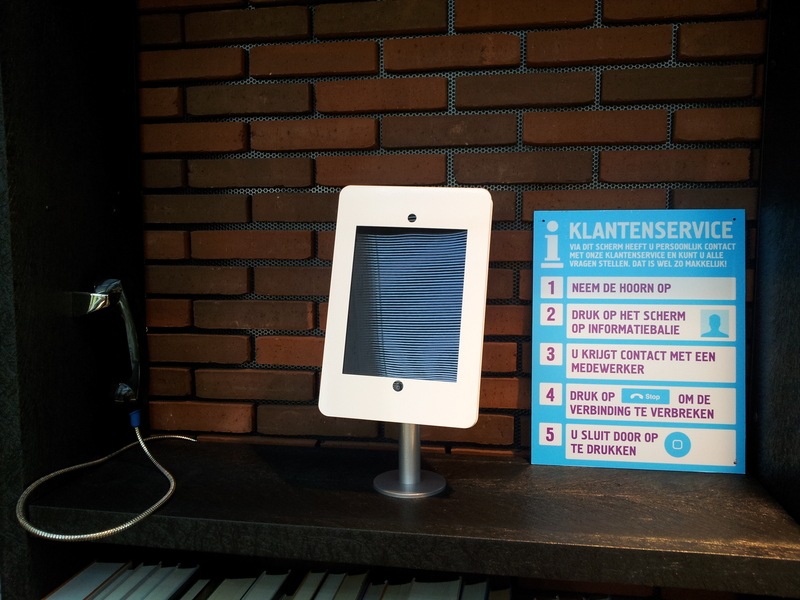 You can return books through several machines. Humans are only needed for sorting and putting the books back in the right place, which is very efficient. Another technological feat was used for customer service. Imagine being at the top floor of the library and there is no librarian in sight. So you walk all the way down to the librarian’s desk and you ask “Where do I find the young adult section?” only to have them tell you that it was indeed on the exact same floor as you were before. The Boekenberg has tablets (iPads for some reason) next to a nice old telephone from which you can phone customer service. As the Boekenberg is four floors up and the librarians are on the second floor, this is quite handy. This phone is great for all the introverts who don’t like to talk to real people but still need answers; as most libraries know, these people are the largest part of their audience. 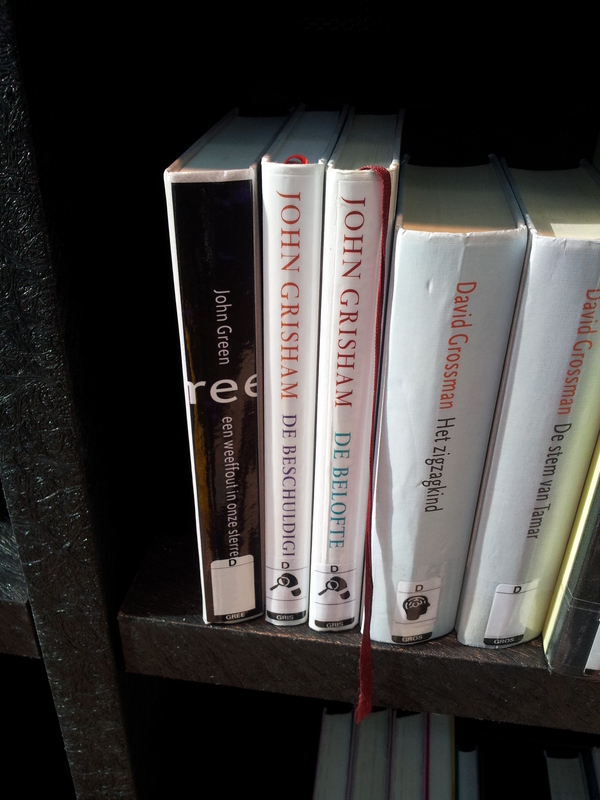 Of course they have John Green at the second best library in Holland! The library is not just hi-tech, it has books and a lot of them. What I like most about this library is that it stores old books that are no longer being lent. During my masters I learned that library books are only lent out about four times, after which they are destroyed. 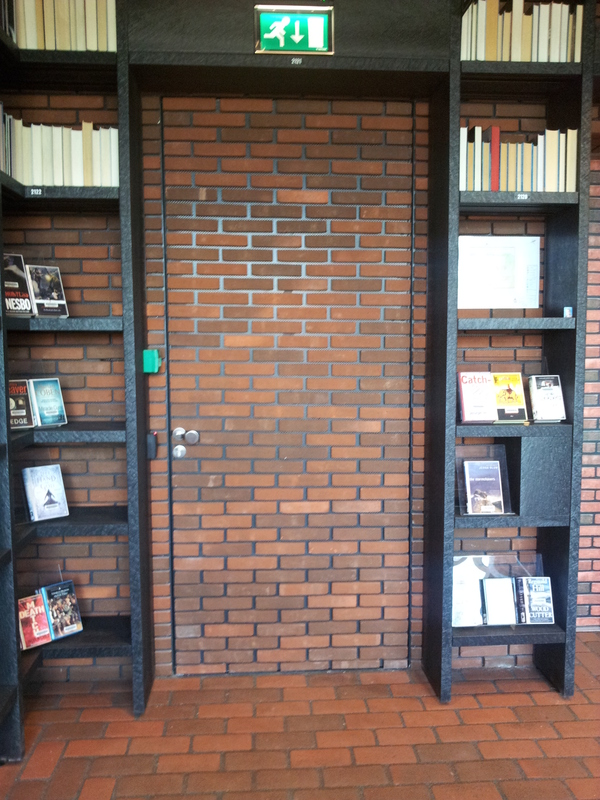 Some libraries will let their patrons buy the books after they cannot lend them out anymore. Not all books will be bought, which means they are all burned. You can read that again if you have to. Libraries burn books. Did this knowledge just turn your world upside down? If so, I am very sorry, please look at some more books. 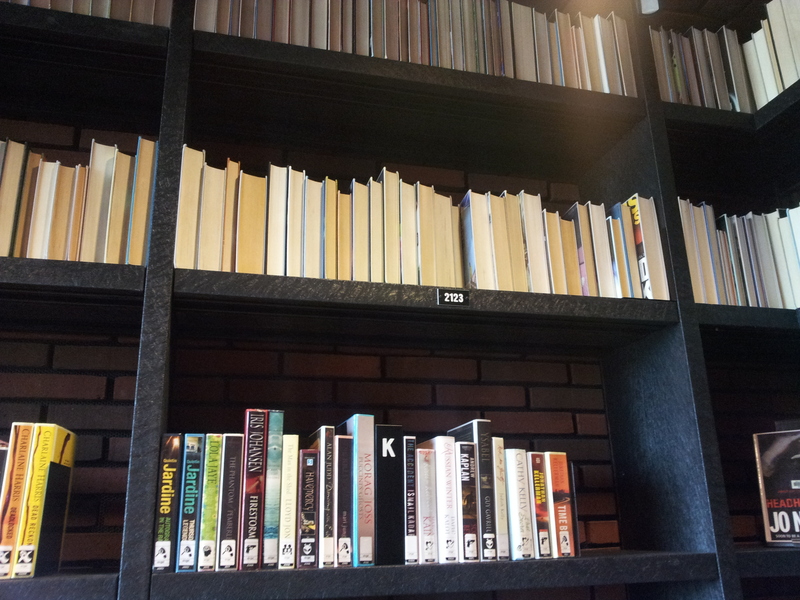 Although the Boekenberg might still destroy part of their collection as well, they store at least some of it on the higher shelves that cannot be used. I even found a weird looking box which I assume is for people to drop of their old books that they do not want anymore. Besides housing books, the library offers rooms and spaces for anyone who might need it. There is a special children’s room filled with books and toys and also an exhibition of the animal kingdom. 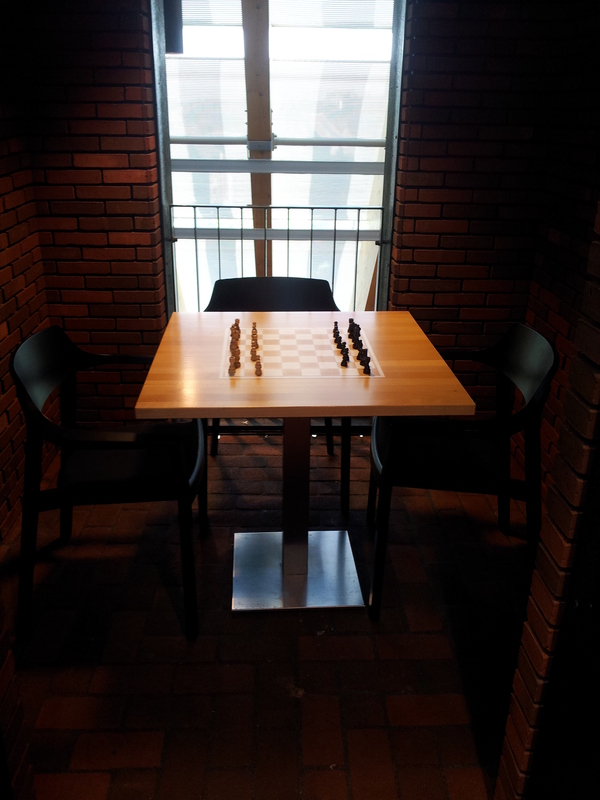 There was a chess match on the day I went there, but no one showed up so there was just one man sitting there by himself looking very lonely. So please go play chess on Tuesdays if you are into that sort of thing. 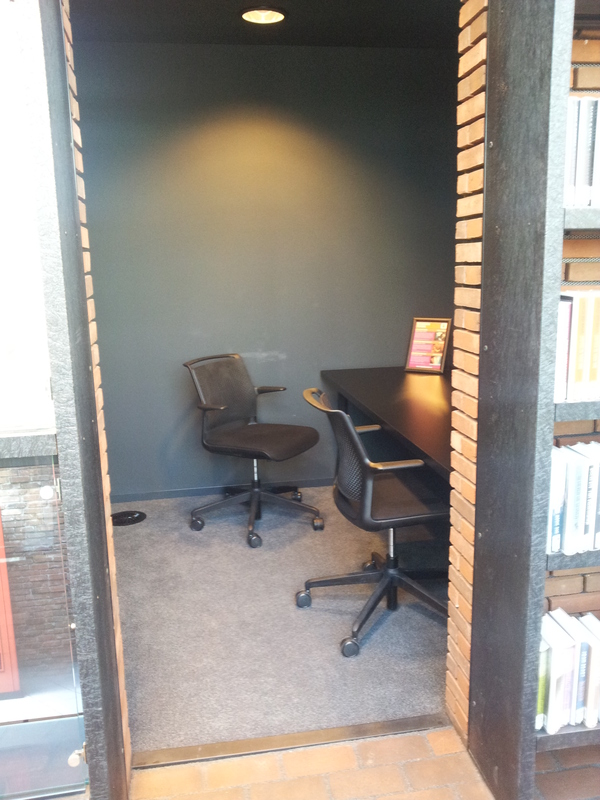 The library also has small studying nooks with a desk, two chairs and power plugs. The nooks are painted black, which I find very calming and really cool. I also love it when libraries and coffee places provide you with power plugs. My laptop battery died only a year after I bought it, so without a power plug I can never work. At the Boekenberg this is no problem at all. They even provide you with a small lamp. What else do you need? A cinema, you say? They have that as well! I walked all the way to the top to find that the final floor was inhabited by old people drinking free coffee and tea. Again a great plant was placed there, right next to hundreds of magazines and newspapers. I imagined myself being older and sitting in a library all day, drinking free coffee and tea while reading everything all day long. I would never go home ever again. The actual top of the library gives you a great idea of how large the building actually is. I am generally not afraid of heights, but I did feel a little nervous sitting there on a bar stool looking out over the rows and rows of books. I walked through the entire library three times and the last time I stumbled on a strange room on the second or third floor that I had not noticed the other two times. 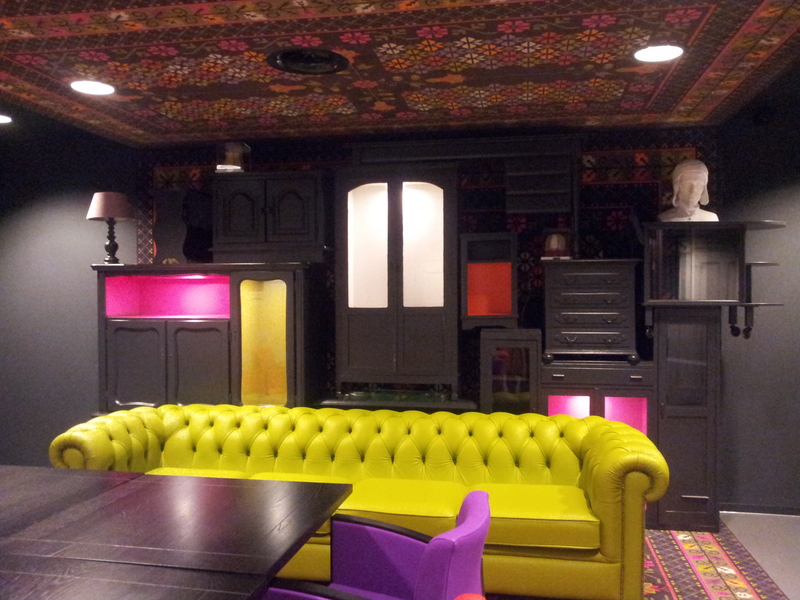 It was filled with colourful couches, the walls were lined with doors and furniture and the carpet was stuck to the ceiling instead of on the floor. I snuck in, looking around if anyone noticed me and snapped as many pictures as I could and then ran out, afraid the room might disappear with me in it. I honestly do not remember how and where this room was, and if it wasn’t for the photographs I might think I made it up. The Boekenberg is a great library, filled with all kinds of other things besides books, which seems to be how a library needs to survive nowadays. But besides the cinema, chess club, children’s room, study halls and crazy conference rooms it still has a huge collection of books and information. It has a wonderful atmosphere and it became my second favourite possible work place in Holland, only just after Etsy. Let’s hope they will hire a recent graduate sometime soon! The best thing about this library is this though. It is filled with secret passageways. 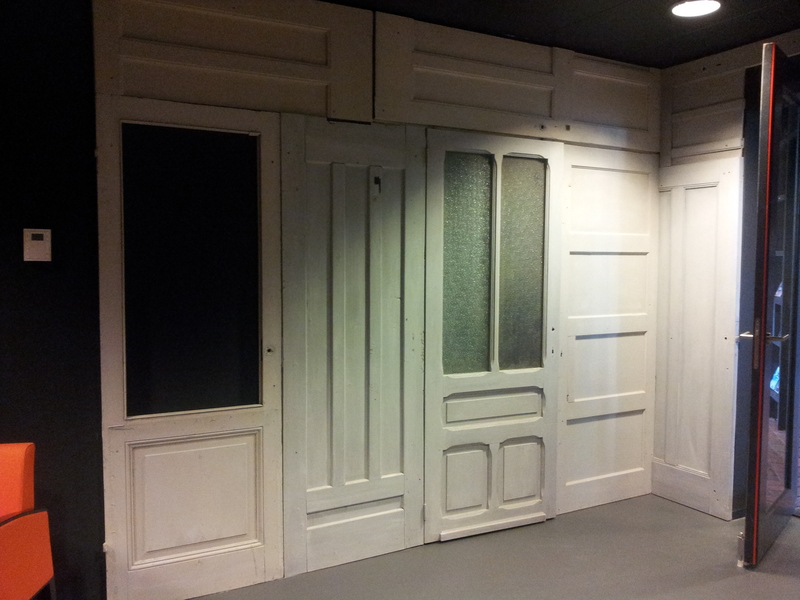 The doors and elevators are hidden behind brick walls and wallpaper, only visible by the small bleepy machines that can be opened with a secret password. I loved that even though the library is very new and incorporates a lot of technology it still retains an air of mystery that a library should contain. To me, libraries are the entrances to unknown knowledge and stories. They contain adventures and if you are really lucky one of these secret doors might lead the way to Narnia. I did not dare to go through it. What if I am too old to go to Narnia?